Intel is clearly tired of Nvidia and AMD kicking sand in its face when it comes to graphics performance. The company has had a talented GPU engineering team for many years. With the fourth generation of Intel’s Core CPU line—codenamed Haswell—those engineers finally get to strut their stuff. And Intel Is launching a new brand to boot to mark the occasion. 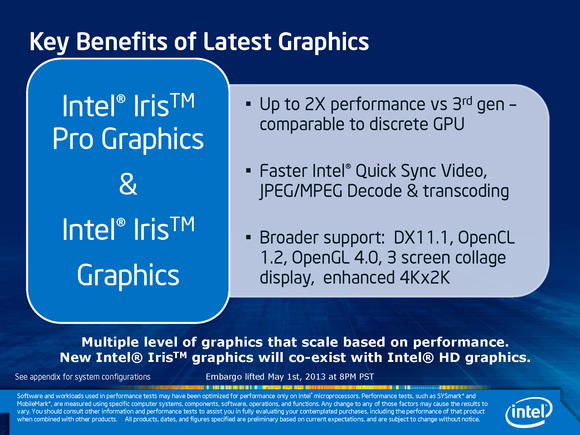 Intel says its new Iris and Iris Pro integrated graphics will deliver higher performance and support more features. 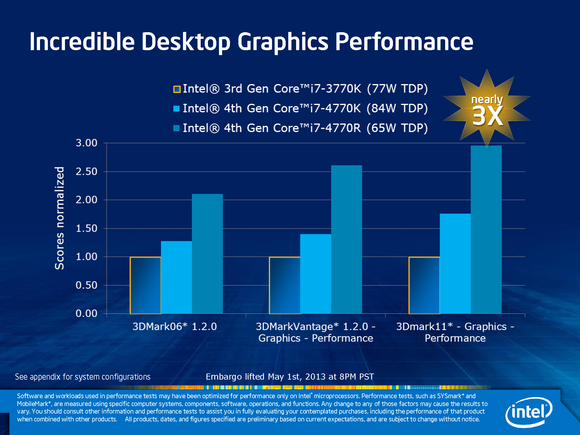 Intel claims that the integrated graphics in its higher-end Haswell CPUs will deliver as much as twice the 3D performance of its existing integrated graphics while consuming much less electrical power. The performance Intel is claiming is on par with Nvidia’s GeForce GT 650M, a discrete mobile GPU that many computer manufacturers use to produce high-end notebooks with credible gaming performance. 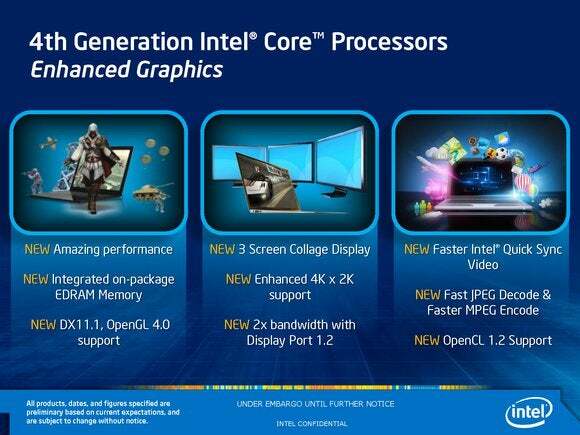 Intel is making some bold promises for the performance of the integrated graphics in its upcoming Haswell CPU line. But it looks as though AMD and Nvidia needn’t worry about competing with Intel graphics at the high-end desktop market. 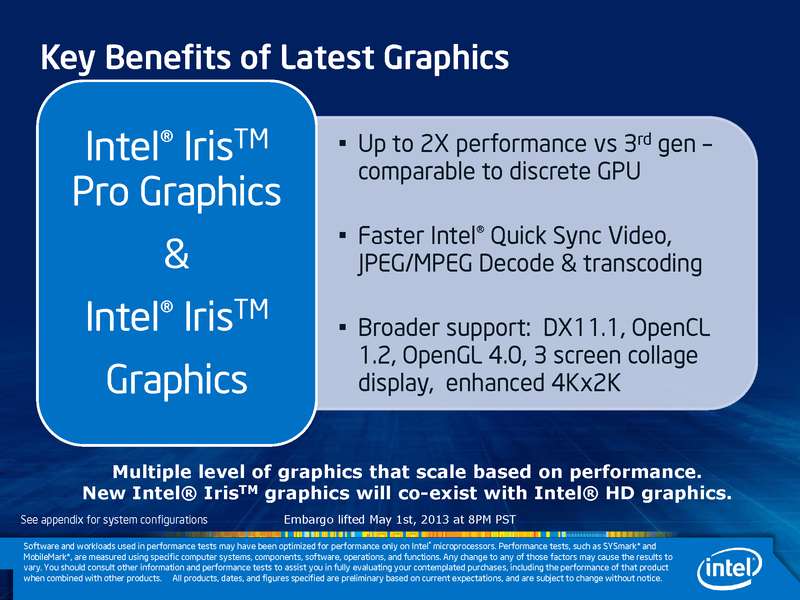 The materials Intel released yesterday indicate that only notebooks (not Ultrabooks) and all-in-one desktop PCs will get Iris and Iris Pro. Ultrabooks and other mobile configurations will deliver better graphics performance than any of today’s models with integrated Intel CPUs, but they won’t get Iris-level capabilities.